I had been eagerly awaiting the holidays. I got to see so many families discharged from the NICU right in time to be home for Christmas and I wasn't sad as I thought I would be as Christmas got closer. I was happy for all of them. I knew our time would come and it's just not that time yet. My cousin Alexa was able to bring both her girls home last week! And another January Due Date mom from "What to Expect" that was in the same NICU with us, got to take her babies home also! Christmas Eve I did just fine. I got to see family from out of town and had a great meal. Christmas Day was unexpectedly hard. I had been excited to go eat Christmas dinner at the hospital that night. We had just finished lunch at my parents house when I realized my (soon to be) sis in law had a cold. Now I know that the majority of you will think I'm crazy, but I just got so scared. I hid in a closet and cried. I am terrified of bringing a single germ to the hospital and getting her sick and not being able to bring Briella home. I am very lucky to have a husband that gets it. He just let me cry. Part of the crying was because I had forgotten to ask if everyone was healthy before we came to a family gathering. I felt like a horrible mother not remembering that we aren't supposed to be around large groups of people. And the other part was realizing that this is our family's life now. Being in isolation. Scared to hurt anyone's feelings. Scared that family would be mad at us. But terrified for our daughter. I came home and had to sleep off the anxiety. When we got to the hospital Christmas night, I held and rocked Briella while we listened to Christmas music. I felt relief.... and reminded I am happy to be in isolation if I get to hug this little girl everyday. 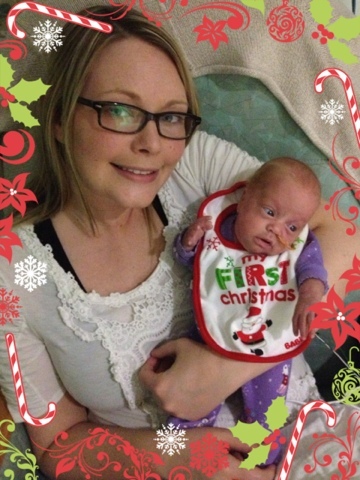 Briella has required oxygen 3 times since Christmas morning. Each time is during a feeding. Her heart rate will drop and she will forget to breath, or get choked up. We believe its due to reflux. The staff is going to evaluate her until Friday and possibly decide to put her back on oxygen just during the feedings. 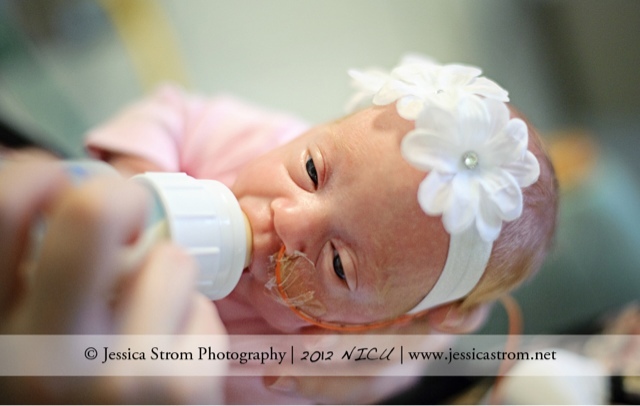 Today while I was holding her for her noon feeding, I saw her choke on reflux, then I could tell she wasn't breathing. Stimulation (kind of like tickling an rubbing) wasn't working so the nurse took her from me and laid her down in her crib. They unzipped her purple sleeper to watch her chest so we could see her breathe. The nurse joked that she was trying to match her outfit. It took a minute or so on the oxygen before she finally came back up. The first 30 seconds or so on it her oxygen levels were getting worse. I thought, okay I'm going to have to watch them get the crash cart and save her. There isn't much harder than to watch your child, or feel your child not breathe. To watch her change colors is gut wrenching. No amount of time in the Nicu will make it ok to watch. I am immune to the heel pricks and blood drops. I'm immune to the alarms. I don't get worried when she loses weight or if she doesn't take her bottle. There are so many things that have become our normal life after 3 months in the hospital, but I will scream on the inside every time I see her turn colors. I will be so happy when my daily vocabulary doesn't include me saying "Briella, don't forget to take deep breaths" or "Come on, breathe Briella!" Miss Briella is 5 pounds 9.4 ounces. Such a big little lady. 16" long. Please pray that Briella's reflux goes away and she is able to breathe normal. Pray that she gets the hang of bottle feeding. That her eyes and herself stay infection free. And that she can come home healthy an happy. We had a a photo shoot done a week ago and kept it a secret for Christmas presents. It was so hard not to share with all of you! 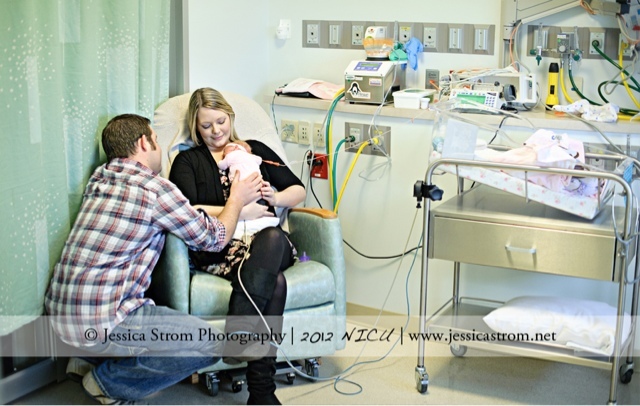 I will post a couple photos with each post :) Jessica Strom Photography does complimentary photo sessions for anyone in the NICU. I am so glad she was able to capture our life as it is.